Visit us in Old Town Lansing for our Early Childhood Music Class, Parent Toddler Yoga, Play Group, or our Messy Monday Arts and Craft Class. Come get messy with us! We do a couple really messy crafts, another craft that uses one of our senses and then read a story. Each Monday has a different theme and Miss Emily cleans up afterwards, not you! Let's have fun! Recommended for ages 1-4. Drop-ins welcome. $6 per child or buy a punch card for $25 for 5 visits. Cash and card accepted at class. Mr. Ben of Munchkin Music Makers helps children make music a part of their lives by providing quality Early Childhood Music Education. Mr. Ben trained at the MSU Community Music School and his class is focused around Music Learning Theory, which at its core aims to enhance children’s tonal and rhythmic audition. Class is geared toward ages 0-4 years. Punch cards are for sale, $60 for 6 classes. One punch per child, per class. $12 drop in per class, per child is still available. Children 0-6m are free if attending with an older sibling. Miss. Melissa makes Parent and Child Yoga fun so you can play while practicing Yoga together. Bring a mat and enjoy your child! She graduated from Union Yoga LLC Teacher Training in 2002 and has specialized in mom and baby as well as prenatal and postnatal yoga. 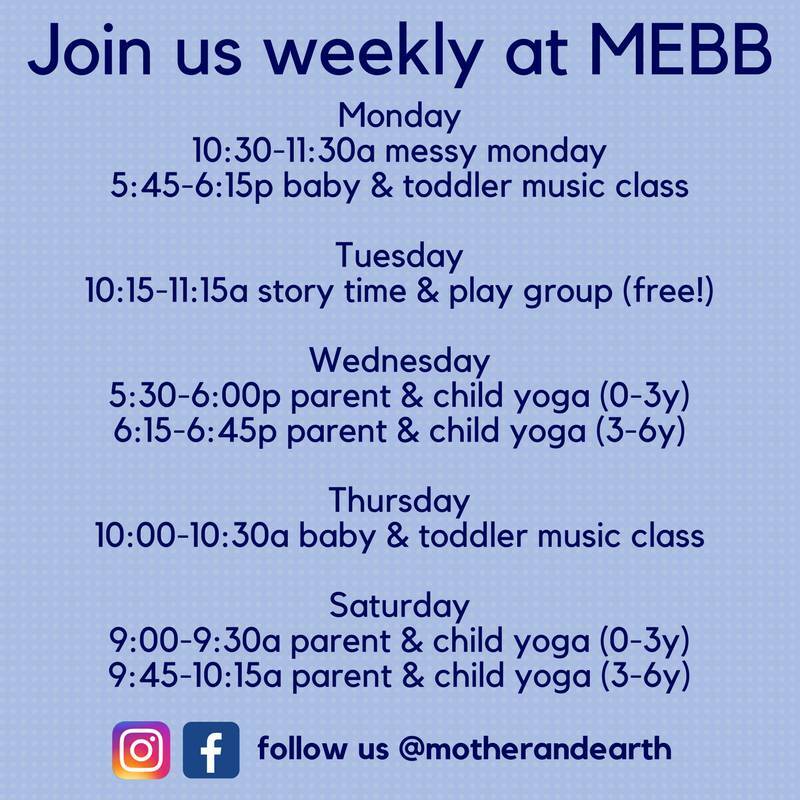 Join Mother & Earth for our free, weekly story time and playgroup. We start the hour off with free play that allows everyone to sit back mingle and play and end the hour with a few stories. Recommended for children 0-4 years of age.